The power & liberation of love, in life and court | Jon Katz, P.C. On this Valentine’s Day, I recall that the 1995 Trial Lawyers College soon became one big hugfest at times. I did not embrace the idea right away, but have benefited tremendously in life from focusing on the path of love, compassion, generosity, service and gratitude. Gerry Spence (pictured here with me when most of my hair was brown)– perhaps the world’s greatest living trial lawyer — who spearheaded the Trial Lawyers College, is far from a touch-feely person. He is brash and his voice can boom. At the same time, he is a hugger — and his hug is indelible — and a deep believer in the power of love. He was a better person to influence me on the same path, than some flower child humming Peter, Paul & Mary tunes on the street corner. I know how essential it is to love my clients, for starters. If I do not love my clients, or at least have compassion for them, who will? I want the judge, jury and prosecutor to see my client for the human s/he is. It is harder to harm someone whom we see as the full human s/he is . It takes too much dualistic energy to decide and discriminate whom to treat with kindness and compassion, and whom not to show the same approach. That does not mean to stand there with an inane grin as others try to harm me or my client, but instead it means that love and compassion are power, and hate is a spreading cancer. The risks on the courtroom battlefield are not to be rued, but instead to be embraced (that hugging theme returns again). This is a land of possibility for obtaining justice, for turning around curveballs, and for obtaining essential intelligence for the fight. We were born as loving, confident, carefree, powerful beings. Somewhere along the path, our parents and teachers tried to instill fear in us of strangers, those up to no good, and social and financial failure. We need to re-take and unleash the full power of our children within us, and remember that love and fear (and, therefore hate and anger, which are rooted in fear) simply cannot coexist. On this Valentine’s Day, I am reminded not only to continue on the powerful path of love in life and in court, but also to continue loving what I do, and doing what I love. 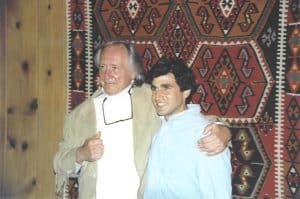 I also remember and deeply thank those who have encouraged me on this path, including my wife, my son, Gerry Spence, Robert Thurman, Sharon Salzberg, Wayne Dyer, Trudy Morse and Ram Dass. They are all there with me as I continue working on myself and on the path of victory.